ZenGRC is a cost-effective, low maintenance, and quickly implemented compliance management software. It has both SaaS and on-premises deployment options; whichever mode you choose provides you with tools that can assist you in your governance, risk, and compliance management programs. As Reciprocity designed ZenGRC to enable end users to employ it comfortably in their daily compliance-related tasks, its interface is easy-to-use and highly navigable thus allowing your personnel to be more productive and more efficient. Moreover, ZenGRC is an agile software that is flexible enough for company leaders to be more proactive in responding to voluminous and high velocity industry changes. With ZenGRC, you do not have to wait long for the software to provide you with results. It is easy to setup and effortless to implement and quickly offers you valuable information about security risks and regulatory compliance. Whether you prefer having cloud-based or an on-premises software, ZenGRC is a suitable solution. It can deploy, either way, making it flexible. Additionally, this brands it as a cost-effective solution because you do not need to acquire steeply priced equipment to run it. ZenGRC enables you to keep track of regulations provided by different frameworks. Therefore, regardless of the regulation body you follow, you can do so seamlessly with the help of the application. A company’s full compliance relies on its leaders’ ability to make intelligent decisions. ZenGRC facilitates your smart decision-making by affording you with a clear view of KPIs for you to steer your organization in a profitable yet regulation-friendly direction. ZenGRC collates data it collects into a central repository where it is easily accessible to dispersed personnel. Having such information within reach allows them to conduct audits, assessments, and reports that indicate all relevant data. For your personnel to be more productive, they need to be able to perform recurring or redundant tasks at a faster pace. ZenGRC facilitates that by providing them with pre-made templates for various frameworks. Thus, they can complete the necessary documentation and tasks to ensure full compliance. If you want to make sure that your organization follows all the rules laid down by regulatory bodies, you have to conduct an in-depth inspection. ZenGRC assists you in that regard by giving you access to framework-related materials that you can use as your checklist, enabling you to finish your audit more rapidly. You and your personnel are not the only ones concerned with compliance. Your stakeholders are too. That is why ZenGRC enables you to add collaborators in the system for them to monitor the company’s progress by themselves. 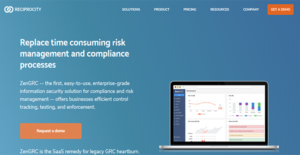 If you are considering ZenGRC it may also be a good idea to examine other subcategories of Best Compliance Management Software gathered in our base of B2B software reviews. Since each enterprise has specific business requirements, it is advisable for them to desist from looking for a one-size-fits-all perfect software system. Needless to say, it would be futile to try to find such a platform even among widely used software applications. The intelligent thing to do would be to catalog the various vital aspects that require consideration such as required features, finances, skill levels of staff members, company size etc. Then, you should do your groundwork thoroughly. Read some ZenGRC reviews and check out each of the other apps in your shortlist in detail. Such comprehensive groundwork can make sure you reject ill-fitting systems and select the system that provides all the aspects you require for business success. How Much Does ZenGRC Cost? If you prefer to have the solution deployed on-premises, you can request for custom enterprise pricing from sales by phone, email, or web form. We realize that when you make a decision to buy Compliance Management Software it’s important not only to see how experts evaluate it in their reviews, but also to find out if the real people and companies that buy it are actually satisfied with the product. That’s why we’ve created our behavior-based Customer Satisfaction Algorithm™ that gathers customer reviews, comments and ZenGRC reviews across a wide range of social media sites. The data is then presented in an easy to digest form showing how many people had positive and negative experience with ZenGRC. With that information at hand you should be equipped to make an informed buying decision that you won’t regret. What are ZenGRC pricing details? What integrations are available for ZenGRC? ZenGRC supports integrations with JIRA and Microsoft Active Directory. If you need more information about ZenGRC or you simply have a question let us know what you need and we’ll forward your request directly to the vendor.